Have you ever thought about painting a room in your house black? Maybe a bedroom, bathroom, living, or dining room? We have painted 2 rooms in our home black and I LOVE the moody look it creates. Making the decision to paint a room black is a big deal..I mean black walls…really? That was unheard of years ago. The recent design trend has been to go dark on walls, cabinets, and furniture. I think this trend has staying power, so I’m willing to make this bold move and dive in…after all it’s only paint and the look can really pay off in the end. It’s been 2 years since we made the decision to paint our gym black. Painting a gym black doesn’t seem all that crazy, right? It’s a gym, a space where you work out and get sweaty, seems like a good place to test out dark walls. Prior to us painting the walls black and the trim white, the colors of the gym were dark purple and bright yellow 😬. Typically in our prior gyms HERE, we would lean towards blue gray hues on the walls, so making the decision to go black is a big change but it paid off and we love the look! You can read more about our present gym in Building “The Ultimate Home Gym” the Rogue Way. Ok, after painting our gym black, we started feeling more comfortable with dark walls…let’s see what other rooms we can paint black that don’t seem too risky. 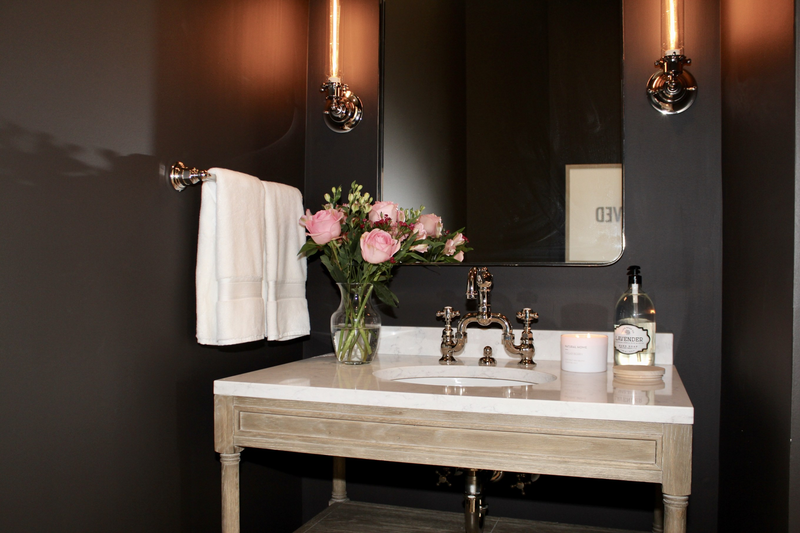 Another good room option for dark walls is a powder room. That’s a room in the house where you can take a big risk with paint, wallpaper, molding, trim or whatever floats your boat. The powder room is a place you can give your guests an unexpected surprise with bold patterns, textures, and furniture. You can even add a black toilet if you want (not that I recommend that) just saying it’s a space in which you can take risks. During a remodel last year of our powder room, we painted our walls black and added nickel finishes and weathered oak furniture. I love the moody look of this powder room. When the sconces are lit, they cast a warm glow in the room which is enhanced with a flickering candle. Makes me never want to leave 🙂 You can read more about this renovation in Powder Room Remodel – Modern French Country Design (Final Reveal). Tip # 1 Black absorbs light, so you won’t get reflections from the walls bouncing the light around, so it’s important to choose your lighting carefully. Adding a chandelier, sconces and lamps with plenty of wattage will ensure you can see the room during the day, especially in rooms where you will spend a lot of time. In our powder room, we have recessed lights over head and sconces on the walls which are controlled separately so we can have the room very light or very dim. Tip # 2 The dark hue should be carried through out the room, meaning replacing all cover switches and outlets a dark colored hue. We added a black outlet switch plate in a glossy finish to the wall. You can also paint the outlet covers and switch plates the same color as the walls, and remember to paint the tip of the screws too! Tip # 3 Choose a sheen of eggshell or higher, matte will show every little scuff mark and leave a chalky reside on the walls. Eggshell is more durable and will retain the rich color over time, a matte finish will fade quicker if exposed to sunlight. Tip # 4 If you have high ceilings, choose a bright contrasting trim color for added effect. Our ceilings are 10 ft high, so painting it a semi gloss white gives a dramatic appearance. But if your ceilings are low, I would suggest painting trim the same color as the wall, making the walls look taller. Tip # 5 Use light finishes and linens to balance the room. I added white hand towels and a white wire basket to hold tissue to brighten the space. The countertop is also white with slight gray veining. Using bright accents to add dimension and add interest to the space, such as pink roses or other accents like pillows will brighten up a dark room. Tip #6 If you’re apprehensive about painting a room black, start small like we did. I picked “safe” rooms to paint black, a gym and a powder room. Here are some other black walls from one of my Pinterest boards. Shauna from the House of Silver Lining painted her brand new dining room black and added modern trim on the walls. Her Forest Modern home is stunning, you have to check it out. In this picture, the walls are very dark and the trim is painted gold creating a very interesting and unusual effect. This picture stood out to me because we have the same ornate crown molding in our home. This living room with shadow boxes is painted all black and looks very sophisticated and rich. A hallway with black walls and stark white molding. I would prefer this look with lighter flooring, the black on black is a bit much for me. What do you think, have you painted any rooms in your home black? If no, do you think you ever will? I really like this idea! I’ve been debating on a charcoal grey or black as accent walls in the bathroom and master bedroom. Really pretty what you’ve done! Hi Jennifer! I recommend starting small with a bathroom to see how you like it. I really like it, and I think an accent wall is a fabulous idea! Thank you for the kind words.